Have I said yet just how much I enjoy going to the free summer movies with my kids? Well, I do! This is one of the things that we all look forward to every summer. I think I get just as excited as they do. Most of the time when I am watching a movie (especially at home), I am distracted. I hear just enough of it to understand the concept behind it. But I hardly ever really sit down & enjoy it. Going to the theatre gives me that extra push to focus on what's in front of me & not what's waiting on me when I get home. This year's choices in movies have really stuck out to me. Even though I have already seen most of them, I am finding all those little "nuggets" that I missed before. Its awesome how God uses the simplest things to open my eyes! This is week 6 & I have cried during 3 of these movies! 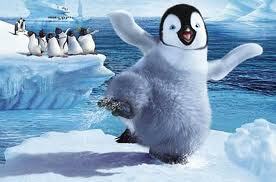 Today we saw Happy Feet 2. This is one of the few kids movies that I haven't seen. Let me just say that if you haven't gotten to watch this one yet, you NEED to! On the outside looking in, it is adorable. BUT, on closer inspection there is so much more! The attitude & determination that those penguins show could change the world! There is so much love & hope in their efforts to unite, save, & make a difference. If only there were more people that believed this way! "Sometimes you have to back up to move forward." "We all have a purpose. Yours is to change the world." "There's only one of me. I am one in a krillion." "You don't have to fly to be awesome."